Frankie Banister and his parents run a hotel but it’s not a hotel that you would have heard of or seen for that matter. The Nothing to See Here Hotel is mostly invisible to the human eye and if you do manage to make it to the entrance, then the waft of foul air will certainly send you in the other direction, quick smart. Will Frankie and the Banisters survive the onslaught and will The Nothing to See Here Hotel escape unscathed? Packed full of amazingly creative creatures, lots of colour and inventive words, The Nothing to See Here Hotel is cover to cover fun, action and intrigue. 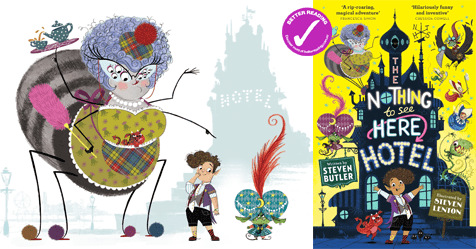 The vibrant world that author Steven Butler and illustrator Steven Lenton have created for the 6+ years reader will have them in stitches but may also inspire them to create their own magical creatures. Fast paced and engaging, this is a great read for reluctant readers and parents will be happy to know that a second instalment will be out later this year, so the fun can continue!